New: IHCI 2015 will take place in Allahabad, India, 14-16 December, 2015. The IEEE approved 6th edition in the series, IHCI 2014, will be held in Evry (near Paris), France, on December 8-10, 2014. Theoretical, practical and application-oriented contributions are invited. Topics of interest include signal and/or vision-based interaction, intelligent Interfaces and applications. The proceedings will be published by Elsevier in open access on ScienceDirect.com. A tentative programme and a call for participation are now available. Registration is open. The conference proceedings have been published in open access as Volume 39 of the Procedia Computer Science . 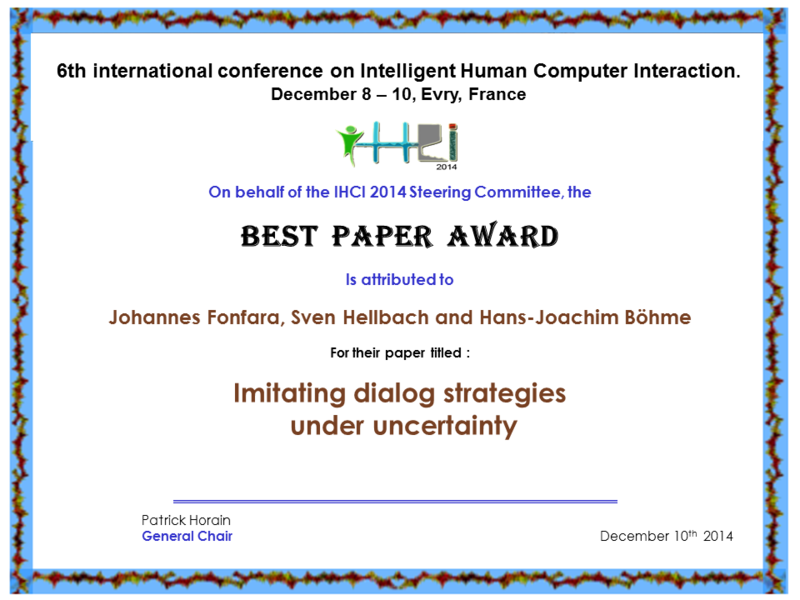 Congratulations to Johannes Fonfara, Sven Hellbach and Hans-Joachim Boehme for their paper "Imitating dialog strategies under uncertainty" that received the IHCI 2014 best paper award. The submission website opened on 20 May 2014. Deadline for submission of (anonymized) papers: 10 July 2014 (final extrension). Authors were notified on 8 September 2014. Final version of papers and author registration by 30 September 2014. Reduced rate registration open until 14 October 2014. Venue: 8-10 December 2014 (in Évry, France).